This marbling paint effect simulates Sienna marble on monolithic columns in a swimming pool area. The faux paint effect was chosen to link with natural stone flooring, wainscoting and decorative tile and mosaic detailing. 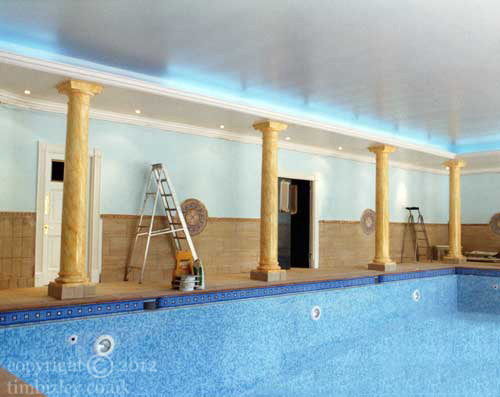 As well as transforming the nature of the columns the effect provides a harmonizing element with the decorations and counter point to the blue tiled pool and other blue detailing used throughout this large pool room. In work of this kind first class preparation of the substrate is necessary to produce quality work. Painted marbleizing yields the ability to transform paintable surfaces into something more fitting to the environment in which they exist.